"I am Toji. Of the Sakimori. For now our goals align, so I lend my strength to you." "A male high school student who carries a cursed blade. He is a Shinto priest in training as well as an exorcist. Because he can hear the voices of the dead, spirits always gather around him. When it comes to supernatural incidents, his powers function like an antenna that can gather the spirits of the dead. He has a strong dislike of optimistic people who don't think things through." A high school student in possession of a twin pair of cursed swords. Touji lives at a shrine in Tokyo where he serves as an apprentice Shinto Priest and demon slayer. Due to his strong spiritual power, he can hear the voices of the dead, and they flock to him. This characteristic of his functions as an antenna that gathers lost, departed souls. A calm and collected thinker, he hates brash fools that rush blindly into a situation. "The blood of the oni flows through his veins. In order to suppress the power this affords him, he has learned to create barriers. The barriers he creates also controls the power of the two cursed blades he wields. The person he respects most is his instructor, who taught him how to use barriers." Demonic blood flows through his body, and he has been trained in barrier arts to seal its power. 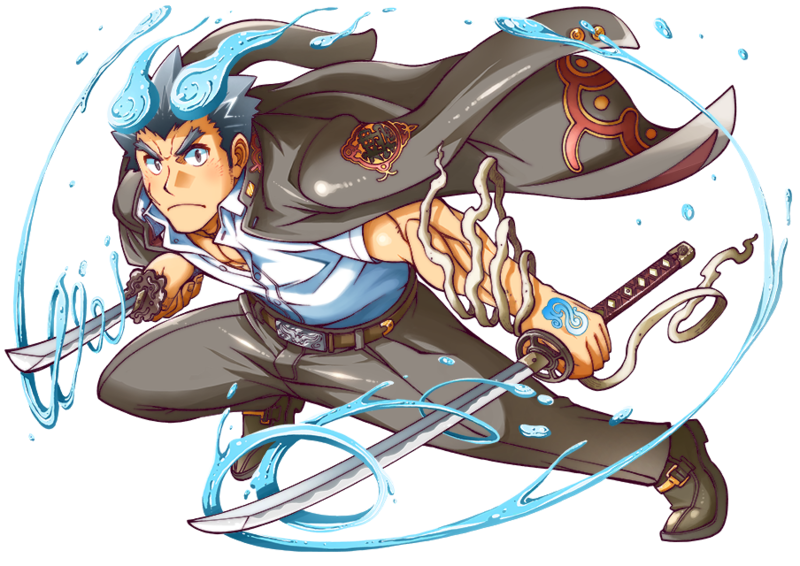 Due to that barrier, he can also control the power with the cursed swords worn at his waist, and Toji deeply admires the master who taught him this invaluable technique. 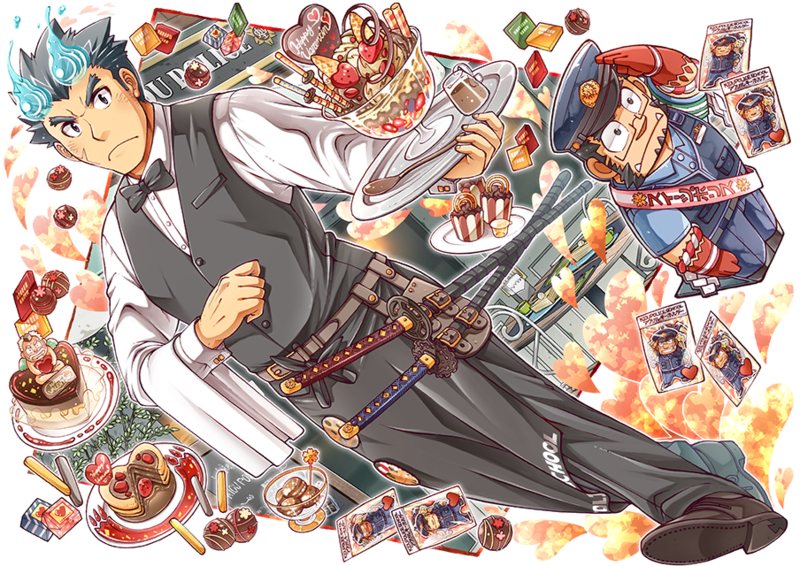 "It's Valentine's Day, and Toji has been asked to help out his teacher in the police force with serving at a food stand for an event. Though bewildered by the different uniform and unfamiliar jargon, the fencing ogre manages to handle all of the orders. With an unfamiliar task in an unfamiliar atmosphere—not to mention friends visiting—Toji finds himself faced with a completely different environment from his ordinary, bloody routine. Everything feels new to him, but the happiness begins to chip away at his normally stoic facial expression. Due to his Role, he must make sacrifices and fight in the shadows to eradicate those who would stand in the way of that which he deems precious, but once the wall comes crumbling down, he will likely be able to serve his own desires." The time is Valentine's. Because of his overly serious personality, he has been roped into helping with an event shop as a waiter on his police master's orders. 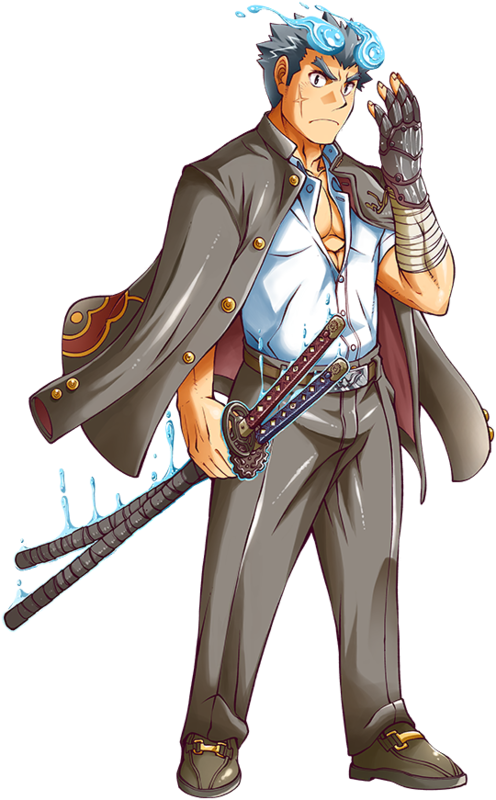 Even as he wears a uniform different from his usual one and his confusion of all cross-wise style writing flying about, the oni swordsman is deftly handling all the orders asked of him. The work he's unaccustomed to, the event atmosphere, the friends coming to see him...the extraordinary that surrounds him is a far cry from the everyday bloody path he's walked to this point. Touji mumbles to himself about how things are filled with stuff he's never done before, and his face is a mix of soft joy and faint disarray. His role as a sacrifice for the righteous, fighting in the shadows, and exterminating the foreign beings that would harm the light is what builds the gap between the two. But if the Walls were to one day collapse, perhaps he could fulfill his own wishes. His full name is Toji Sakimori (崎守トウジ). You still have a sweater skin? The new variant is good but I pulled him 3 times trying to go for Shino. 3 freakin' times. I’m so glad LW finally did Toji some justice by giving him a variant that completely dominates in battles. I think Toji was based on Rin and Yukio combined. I mean, the blue flames and those flame horns and the design lol. Blue Exorsist is that u? You can call me 'Dante the Demon Killer'. Has a nice ring to it, don't you think? I love this self hating fool soo much!! This page was last edited on 18 March 2019, at 05:28.